...for all things sweet and festive. 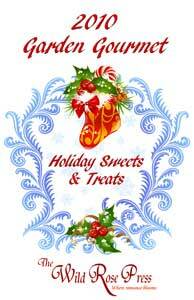 To help you plan your holiday festivities, The Wild Rose Press is offering a free download of its 2010 cookbook, Holiday Sweets and Treats. Comprised of recipes contributed by TWRP authors, the PDF also contains a cookie recipe from me, handed down from my father's sister to my mom. Mom made a wicked good cookie. Unfortunately, most of the cooking genes in our family passed to my sister, but this recipe's as near to foolproof as they come. Download yours today, and make lots of great dishes for your holiday guests! That's exactly what I need. Something not even I can mess up. Sometimes I envy my sister her cooking skills! She even grows her own herbs. But this cookie recipe levels the playing field - or the kitchen, at least. And they're yummy! Italian Anisette cookies, mmm.